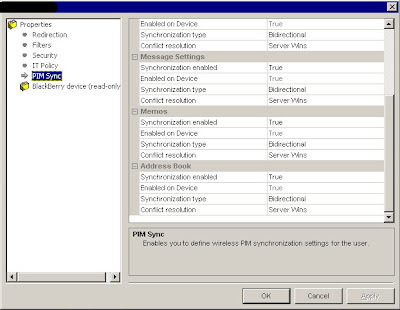 This recipe gives a quick overview on how to setup custom sync settings for Blackberry users. This is nice for the users who do not want email or calender contacts or tasks or notes synced on their blackberry device to Exchange/Outlook. 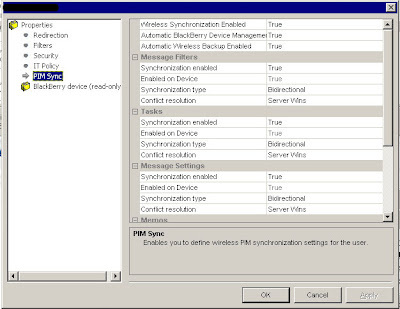 This will also show how to setup a user for the first time on the BES / Blackberry Manager. Setting up a user with custom sync settings (in this example, everything will sync w/Outlook except address book). 1. Open up the Blackberry Manager. Click on your BES server and switch to the Users tab. 2. Click on the Add Users option under Account section. Add the user. Click OK.
3. Now click on the Service Access tab on the right. Then click on the “Set Activation Password”. You can define how long the password is valid for and also the password itself. Click OK when your done. 4. Lastly, we will now setup the user properties so that we do not sync the users’s contacts to the blackberry (user had over 1000 contacts). Click on the “Edit Properties” button on the right Tasks pane. This will open up the User Properties screen. Click on the “PIM Sync” option on the left area. You can now choose sync options for all outlook items. In this example, i’d scroll down to Address Book and click False on the “Syncronization enabled” option. Once your done click OK. This screen also lets you setup redirection, email filters and get device info. The account should be ready to get setup on the device and start syncing the all items minus the address book. Pretty easy stuff. Now just go to the device and click on the Enterprise Activation icon and enter the users email address and the password we created.